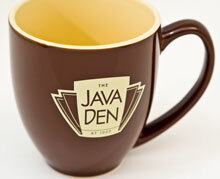 First of all, you need a cup filled with pure java heaven. Then, you need the cup. The perfect size, shape, look and feel for just around $7. A mere pittance to show everyone that your taste in coffee is more discerning than a New York Times food critic. Coffee snobbery? Yes. People like stuff, people want stuff, people, we’ll soon have stuff. Cool clothes when it’s warm. Warm clothes when it’s cool. Cups for anything hot or not. We just ask that you be patient with us for a moment, we are having too much fun designing the inaugural collection. Perhaps to debut this fall?